In a period of six weeks, more than four-hundred yachts sail across the Atlantic Ocean from the Canary Islands to the Caribbean. 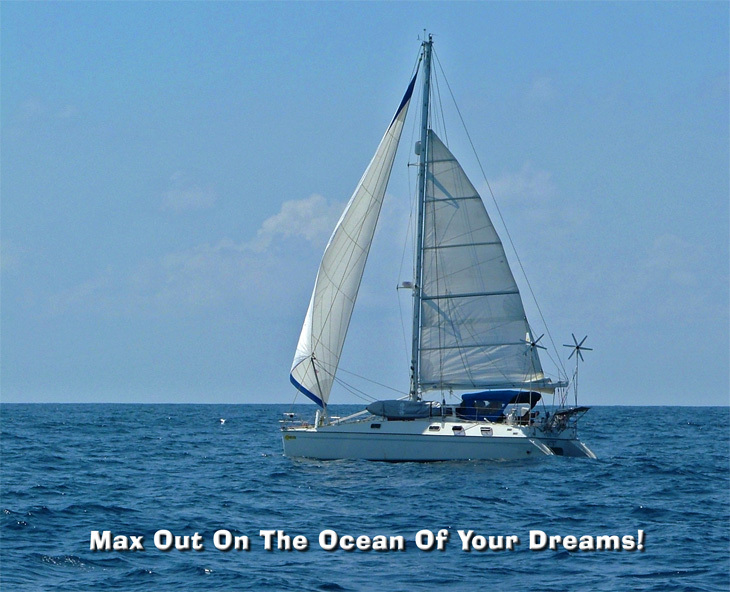 The largest group of yachts consists of the ARC, the Atlantic Rally for Cruisers. In 2005, the ARC had over two-hundred and thirty yachts signed up to make the trip TOGETHER - although together doesn't really mean together, except at the start. Together means they do it at the same time, sort of. The only time they really are together is in the Canary Islands when they start the rally, and they leave on the same day from Las Palmas. Since the yachts range is size from thirty-five feet to over one-hundred feet, it doesn't take long for the boats to disperse as they sail over the horizon. We were told that the ARC costs one-thousand two hundred euros per yacht and one-hundred and fifty euros for each person on board. If we had joined the ARC, it would have cost us $2000 in fees. We didn't join, and saved $2000 worth of freedom chips.. Instead, we formed our own rally which I call the NARC - the Non Atlantic Rally for Cruisers. There are several hundred yachts in the NARC, and everyone leaves whenever they choose, and there are no entry fees. The NARC flotilla is extremely diverse with yachts of all sizes and designs - monhulls and multihulls, and they come from dozens of different countries, and they have crews from an equal number of nationalities. They didn't join the ARC for many reasons, but the two biggest are that they didn't want to spend the money, and they didn't want to be forced to leave on a specific date irrespective of the weather. In former times, the ARC provided benefits to cruisers such as weather routing and theoretical safety in numbers. But times have changed, and weather routing is accessible to even solo cruisers who don't belong to any group. Email, weather fax, and satellite communications are now commonplace on yachts, giving easy access to weather information and weather routing. In fact, there is so much easily accessible free weather information that the average cruiser has to contend with severe information overload. Groups of yachts form transatlantic radio nets that collect and disseminate weather information free of charge. For people who want professional routing, every evening they can check in with Herb Hilgenberg on Southbound II from Canada, and he will give them a precise weather analysis and customized prediction based on their specific latitude and longitude. If you don't have good weather information and good weather routing on your yacht, it's your own fault because it's cheap and available. Starting a two-thousand seven hundred mile passage across the Atlantic is no small task, and it's not to be taken lightly. Your boat needs to be in good condition, and you need to avoid gross and serious weather blunders that can be dangerous, or at least make your voyage uncomfortable. Crossing the Atlantic involves significant weather risk because the trip takes two to three weeks, and weather predictions are not accurate for more than two or three days in advance. So what's a person to do? How do you deal with the possibility of tropical storms, hurricanes, strong cold fronts, and other potential nasties during the voyage? And what if there is no wind at all, and you need to motor for one-thousand miles? You obviously need some basic contingency plans, but you also must accept the fact that the weather is out of your control once you set off. Fortunately, God gave you a brain, and when you cross an ocean, you need to turn it on and use it. Crossing an ocean is mostly common sense. For us that meant putting extra fuel on board. We added enough jerry cans and fuel bladder tanks to extend our motoring range to about one-thousand four hundred miles, which means we could motor one-half way across the Atlantic if necessary. This year the eastern Atlantic has been windless. The trade winds were disrupted in December by Tropical Storm Delta and Hurricane Epsilon, and this has been the most active year for hurricanes in decades. So we prepared ourselves to motor across windless zones if need be, and if a hurricane pops up, we would immediately head south and motor into the doldrums, since hurricanes don't usually go there. We download weather faxes twice a day to be sure there are no threatening weather systems near us, and we download grib files to see the predicted wind direction and speed for the next several days. We put all this information into our heads, add a dash of common sense, whisper a prayer, and see what emerges from the hopper. We then decide whether we will raise our sails, furl our sails and start the engine, go into a holding pattern, or head south and hunker down if severe weather threatens. There are old sailors, and bold sailors, but no old bold sailors, at least not among our friends. Our goal is to become old sailors, and leave the bold to other people, like the ARC which leaves port on a specific date irrespective of the weather forecast. ARC or NARC. The choice is yours.